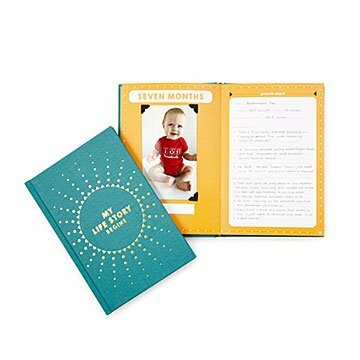 Parents can capture all the stories and moments (big and small) to create a meaningful keepsake. Of course, there's plenty of dedicated space throughout for photos of your little one as they grow: because no parents ever say, "They grow up too slow." Made in San Antonio, Texas. Three sheets of 36 photo corners are included to allow for mounting of your keepsake photos. I bought 3 for myself for my children and 2 as gifts. This is a great book and snapshot of a child's first 5 years!! Perfect for the non scrap booker! I like that it looks like a regular ol book, my two year old is not that interested in looking at it...this it'll stay nice!